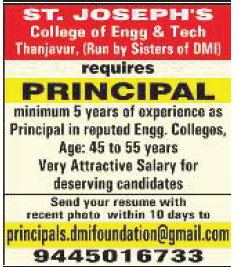 St.Joseph's College of Engineering and Technology, Thanjavur has advertised in THE HINDU newspaper for recruitment of Principal jobs vacancies. Interested and eligible job aspirants are requested to apply within 10 days from 12th August 2018. Check out further more details below. About College: St. Joseph’s College of Engineering & Technology is a Christian Minority Institution of Higher Technical Education, approved by the All India Council for Technical Education [AICTE], Government of Tamilnadu and affiliated to Anna University, Chennai. The College is promoted and managed by Sisters of DMI, which was founded in the year 1984 by Rev.Fr.J.E.Arulraj, OMI. The Society manages several educational, technical, health, welfare and social development Institutions.